I love using my No. 48 to make grooves for door panels. When I’m making thin styles and rail (1 3/8″) I still don’t have a great way to hold the work. If you have a magic trick, please share. Any way, the door is starting to shape up. Makin’ grooves in the styles. Sneak peek at the curly cherry panel for the door. This entry was posted in bed side table, curly cherry, door and tagged bedside table, door, No. 48, rails, styles. Bookmark the permalink. Do you have an End Vise (aka Wagon Vise)? If so, I’d consider using pinching between dogs on with the end vise. Then perhaps backup up workpiece with fat (but lower than workpiece) hunk of wood secured with holdfast or other clamping. I do not have No. 48 (or equivalent), but seems that would work for you. You can also use the mating workpiece to give a wider surface for the plane if that helps. Hmmm .. yes .. I think I’ve tried that, but I’ll try that one again. Good idea. I just clamped it up in my end vice (poor man’s wagon vice) with a batten and it worked fabulously. Follow up post tonight. What Tom said but use a v blocks to hold style. so the dashed line is the style cramped between a couple of v blocks. I’ve had the same quandary. I’ve tended to hold the stile in wooden handscrews on each end; in the past, I pushed the front one up against my planing stop and the sides of both against a stop in my split workbench top. Now that I have an end vise, I’ll probably use it to capture the handscrews. There is also potentially the (Paul Sellers) method of using a bar clamp to grab the ends of the stile and then clamp the clamp in your face vise. Might not work with flush mounted vises; never tried it, but might work for you. I use a No 248 for grooving, I think it is a little smaller, but otherwise pretty much the same. (The second last picture). 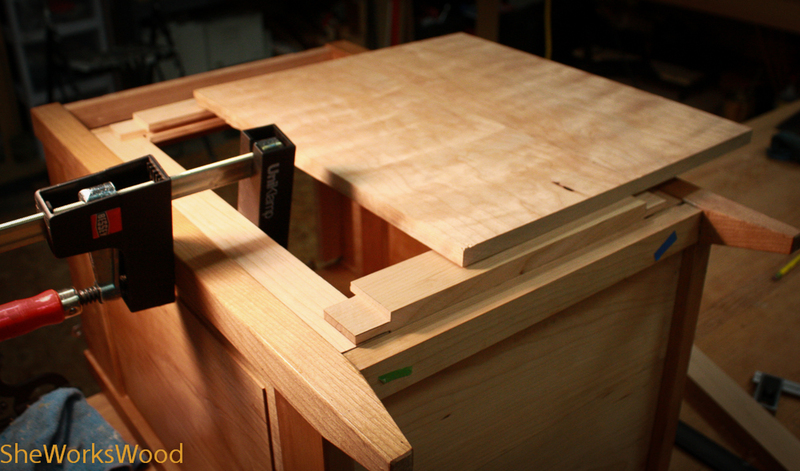 The support is held to the work table with a clamp at the far end. The board was held in a similar way for the sides to be grooved. except that I didn’t have to use a “upright backing” support as well. I hope this idea helps. Have you tried using a sticking board? 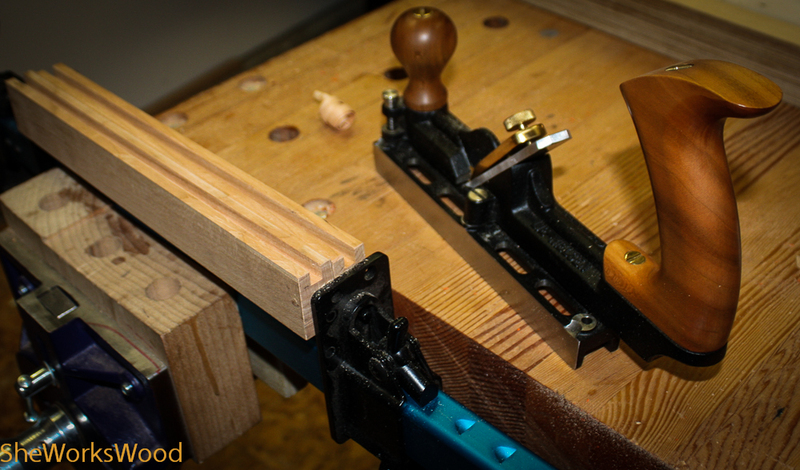 I used one for planing grooves in 1 3/4″ stock for a pair of Arts and Crafts end tables I have been working on. The nice thing is that with a sticking board, you don’t have so anything blocking the plow plane iron at the near end, and only a couple of screws whose heads act as a planing stop on the far end. You can see the set up on my blog here: http://goo.gl/480duh. Derek Cohen describes how to make an adjustable sticking board on his site: http://goo.gl/7BvJwI. I hope this is helpful. Keep up the great work! Hmmm .. I do have a sticking board, but haven’t tried this on it. I just clamped it up in my end vice (poor man’s wagon vice) with a batten and it worked fabulously. I need to try the sticking board option as well. I just looked at Derek’s adjustable sticking board. Very clever! I might have to build that. Thanks for the link! I think I’ll have to build one, too. It would certainly be better than having to throw a new one together whenever you choose to change the width of stock you’re sticking.